“Ty Cobb – Signed Letter Authenticated by PSA/DNA. The photo shown on the auction page was a very fuzzy image of a two page letter, dated October 26, 1953, handwritten in green ink, and the air mail envelope in which it had been sent. The eBay seller has placed a large watermark onto the photo, presumably to make the image unusable to those who might download and use it for other purposes. Nine years earlier in 2001, Ron had done an exhaustive survey of material about Ty Cobb that was indexed or available on the internet. He was gathering information to be used in a writing effort on Ty Cobb he was contemplating as his retirement neared. One interesting discovery from this survey was a collection of handwritten letters that Ty Cobb had sent to his friend, Taylor Spink, the Editor of The Sporting News. Images of these letters were shown prominently on the TSN website, as well as typescripts. At that time, Ron carefully studied these letters and made notes for his research purposes, thinking that they might someday be useful in his planned efforts. As it turned out, Ron never actually used The Sporting News letters, as the thrust of his planned efforts changed from writing to editing and publishing. But, he did not forget these Ty Cobb letters. From his 2001 survey, Ron had discovered a large amount of early published material by or about Ty Cobb. These early documents gave a much different portrayal of this baseball icon than did the many publications since Ty’s 1961 death. Rather than undertake the effort to write a new book about Ty Cobb, Ron decided to edit and publish some of the long forgotten material he had discovered. He started by editing and publishing “Memoirs of Twenty Years in Baseball” in 2002. Ty had written the chapters of this autobiography as a series of syndicated articles in 1924, amid speculation that Ty would end his career completing his twentieth year at Detroit. The series was very popular and widely read at the time, but was soon lost in the archive stacks and library microfilm, as no modern biographer had referenced this early work. 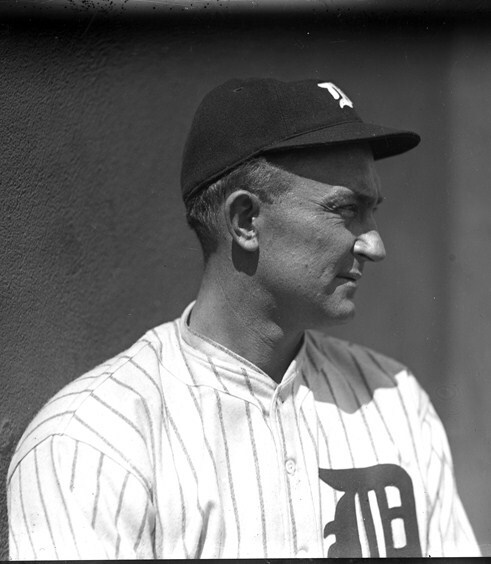 Ron felt that editing and publishing this work now would present a new and interesting perspective on Ty Cobb as both a person and a player. After selling several hundred copies through the internet, Ron donated all the profits from the book to the Ty Cobb Museum in Royston, Georgia, which still sells this work in its gift shop and internet store. Later, Ron released an edition of Ty Cobb’s ghost-written 1914 book “Busting ‘Em,” again donating the rights to the book to the Ty Cobb Museum. In his 2001 survey, Ron had also discovered Harry Salsinger’s 1951 biography of Ty Cobb titled “Which Was Greatest: Ty Cobb or Babe Ruth.” Salsinger had written this serial biography of Ty Cobb for The Sporting Newsin 1951, a time where there was a swirling controversy about the relative greatness of Ruth and Cobb. This biography, also largely forgotten, was unlike all biographies of Ty Cobb published before or since – it was written by a someone who actually knew Ty Cobb well, and had actually seen him play throughout his entire career. Salsinger, long-time Sports Editor for the Detroit News, had a unique perspective from which to write about Ty Cobb, and produced a biography was vastly different from other biographical works. Ron felt strongly that it, too, should have a much wider distribution. However, to reprint Salsinger’s biography, it was necessary for Ron to get permission from TSN, which still held the copyright. A blind inquiry to TSNled him to Steve Gietschier, then Editor and Chief Archivist for TSN. Ron described his proposed project to Steve, emphasizing that all profits from the reprint would benefit the non-profit Ty Cobb Museum. Steve agreed that the project was worthwhile, and charged Ron the nominal sum of $100 for the right to print 5000 copies. This biography was finally issued in 2008 and is now sold exclusively through the gift shop of the Ty Cobb Museum in Royston. When Ron first discovered this eBay auction page for the Cobb letter to Spink, he was surprised that the seller had posted only a single fuzzy image of the two-page document, obscured even further by the superimposed watermark. While portions of it could be read with some difficulty, much of it was not legible at all. Additionally, the seller did not offer a typescript of the letter in the item description. Any auction for a valuable letter such as this always shows a detailed image, and if there is interesting baseball historical content, will usually include the text of the letter as well. The photo that was posted, however, was legible enough to show the date of the letter, and that it was addressed to Taylor Spink. This immediately raised Ron’s suspicion as he recalled the letter images from The Sporting News website. By enlarging the posted letter image, Ron was able to make out a few of the words in the letter, but not enough to read it entirely. Ron again went to the TSNwebsite and searched for the Ty Cobb – Taylor Spink letters he recalled. He found that the images of the letters he recalled were no longer displayed. However, the typescript of eleven letters from Cobb to Spink were still shown. One of the letters still on the website was dated October 26, 1953, and had a postscript from Ty describing his investment in Coca-Cola stock and its dividends and future earnings. In this postscript Ty strongly advised Taylor, apparently not for the first time, to purchase this stock as he himself was continuing to do. Ty even noted that he had advised his own daughter, and his widowed daughter-in-law, to purchase shares of Coca-Cola as well. By examining the enlargement of the fuzzy letter image from the eBay auction page, Ron was able to make out the word Coca-Cola, and with some difficulty a few of the other words in Ty’s postscript. Comparing the dates and the Coca-Cola reference to the posted letter convinced him that this was, without a doubt, the Ty Cobb – Taylor Spink letter from the TSN collection. 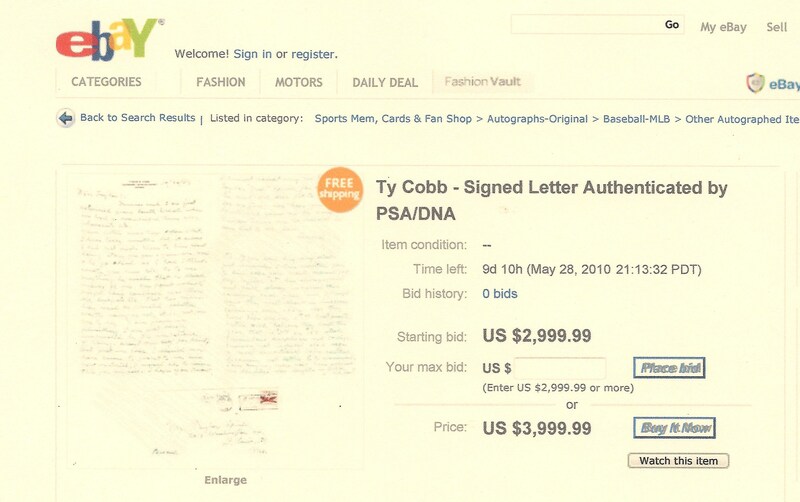 TSN's Stolen Ty Cobb Letter was offered on eBay for $3,999.99. The image of the letter was blurred and there was no mention of the letter's content. First, Ron contacted Peter Nash, operator of the Hauls of Shamewebsite, which delves into the world of stolen and fraudulent baseball memorabilia and exposes new discoveries for collectors and historians. Only a few weeks before, Ron and Peter had corresponded about an article that Ron was writing for publication in the summer 2010 issue of SABR’s The National Pastime. Since Ron’s article dealt, in part, with fraudulent baseball memorabilia, he had asked Peter to assist in the final review of his text before publication. The May 19 email Ron sent to Peter included links to the eBay auction page for the Ty Cobb letter, and to The Sporting News website. It asked that Peter make the same comparisons that he had already made. Ron concluded his email with: “Check out the first line of the PS – about Coca-Cola stock. Then look carefully at the same line in the fuzzy image posted on eBay. It has to be the same! So, unless The Sporting News has decided to sell their Ty Cobb letters, then this must have been stolen.” Peter’s reply was that it certainly looked suspicious to him, and he encouraged Ron to contact The Sporting News to investigate. Next, Ron emailed his old acquaintance from The Sporting News, Steve Gietschier, to ask if he was aware if any of the letters in their archive collection had been sold. Steve no longer worked at The Sporting News, but since he had organized and archived the Cobb – Spink letters in their collection, he was familiar with the entire archive. Steve replied that he was not aware of any items having been sold from the TSN archives, and that he strongly suspected that the letter had been stolen. Peter Nash made the initial contact to The Sporting News, and was directed to Shawn Schrager, TSN’s director of commerce and licensing. Neither Shawn, nor anyone else at The Sporting News was aware that a possible theft had occurred. An inspection of the archive files indicated that there were gaps in the sequence of numbers that had been written on the bottom of each letter, leading to a suspicion that perhaps several letters were missing. Shawn was able to make out a barely legible number on each page of the two page October 26, 1953 letter on eBay – a further indication that this was indeed a letter from The Sporting News archive. On this basis, Shawn contacted eBay to ask that they investigate the item, and the seller, but was told that he needed to have law enforcement make official contact. Peter then emailed his contact at the FBI who has investigated other baseball memorabilia thefts, and asked him to review the auction for the October 26, 1953 Cobb letter. After completing his review, the contact concurred that the letter was likely stolen, and contacted Shawn to advise that he first contact authorities either in Charlotte, NC , the present corporate home of TSN, or in St. Louis, the former headquarters of TSN and the stated location of the seller. Following several phone calls, Shawn reached the police department in the St. Louis suburb of Chesterfield. They quickly evaluated the information given to them and agreed to take the case. An official contact was made to eBay for the name and email address of the seller. With this information, the seller’s physical address and phone number were located, proving proper jurisdiction in the case. Posing as an interested buyer with a fictitious name, the Chesterfield authorities made contact with the seller and arranged a meeting to examine the letter and make the purchase. On June 9, without disclosing details of their interaction with the seller, Chesterfield authorities notified Shawn Schrager that the letter was in their possession and would be returned to The Sporting News within a few days. There is doubt that a warrant for possession of stolen merchandise will be issued due to lack of evidence that the eBay seller knew the item was stolen. So, unless some further evidence can be gathered implicating the eBay seller in the actual theft, no action will likely be taken against her. The case is not yet closed, however. When Shawn Schrager returned the letter to the vault, he confirmed that at least one additional letter is missing. Steve Gietschier had carefully numbered each page of this collection of letters when he originally archived them for The Sporting News a decade ago. 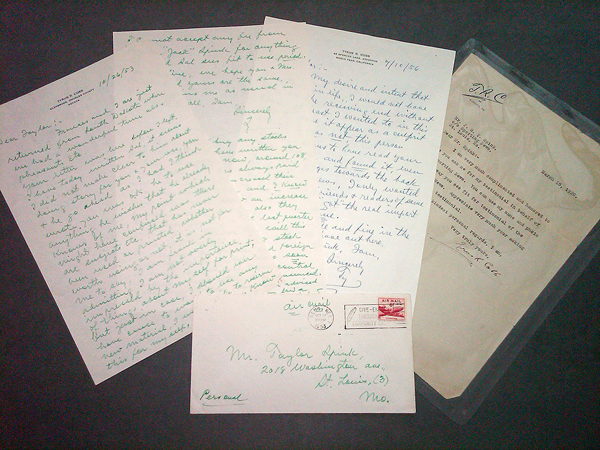 The two pages of the recovered October 26, 1953 Cobb letter were numbered 15 and 16. Pages numbered 17, 18 and 19 are missing from the archive vault, and are now assumed to have been stolen at the same time. Chesterfield authorities hinted that other letters might be in possession of the eBay seller as well. While all of the details of the investigation are yet to be released, there is no doubt that the archives of The Sporting News were pilfered. Many questions are yet to be answered: Was the eBay seller the actual thief? How was access to The Sporting News archive achieved? What other valuable and historically significant letters are missing from the archive? HaulsofShame.com will follow this developing story and report further details as they are available. What an interesting article on a Cobb retrieving a Cobb. It’s good to see a recovery for a change, thanks to Mr. Cobb’s sharp eye. I have always wanted to visit the Ty Cobb Museum- maybe the Sporting News could loan them the letter for a special display? Hope to see more items recovered and some consequences dealt out to any seller who can be proved to be “fencing” stolen property. Speaking of the Sporting News, we all mourn the loss of the legendary baseball writer and researcher Cliff Kachline. Working for Taylor Spink and TSN as a writer and editor from the 40s through the 60s, Cliff was also one of the founding members of SABR in 1971. Always supportive and accessible to baseball researchers young and old Cliff also left his mark through his great work for many years at the Baseball Hall of Fame Library- he will surely be missed by all who knew him. Another famous baseball archive pilfered! How appalling. Thank you, Peter, for investigating and revealing this robbery. Interesting- I found this article while doing reserch on several Ty Cobb postcards and one letter in my family papers. They’ve not yet been formally certified but all indications are that they are genuine- all dated 1916. I can prove legal ownership as they’re addressed to a relative but I have no idea how begin selling them- dealing with those big auction copanies is kinda scary! Very interesting, I can now say I read this blog.